Released 1988: The Amiga 2500, also known as the A2500, was an Amiga 2000 factory installed with a Motorola 68020 or 68030 CPU card with 2 MB or 4 MB 32 bit RAM (Fast RAM). It also came with an SCSI controller and hard drive like the Amiga 2000HD. 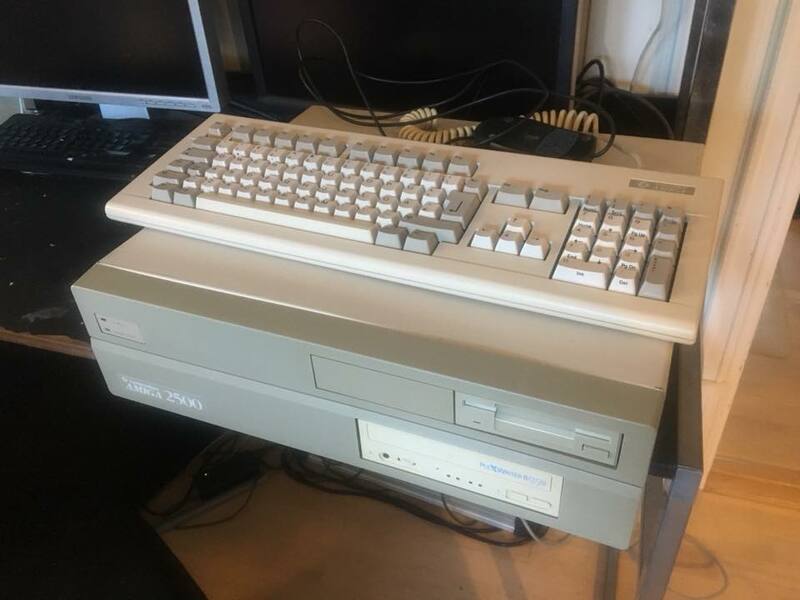 The original Amiga 2000 shipped with just a single floppy drive for storage. 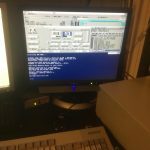 This was followed up fairly early by the Amiga 2000HD, which bundled an A2090 hard drive controller and a SCSI hard drive. In 1988, Commodore shipped the Amiga 2500/20, which added the Amiga 2620 CPU card to the CPU slot. It contains a 14.3 MHz Motorola 68020, a 68881 FPU, and a 68851 MMU along with 2 MB of 32-bit RAM (Fast RAM). The A2000’s original 68000 CPU remained installed on the motherboard, but was not used. 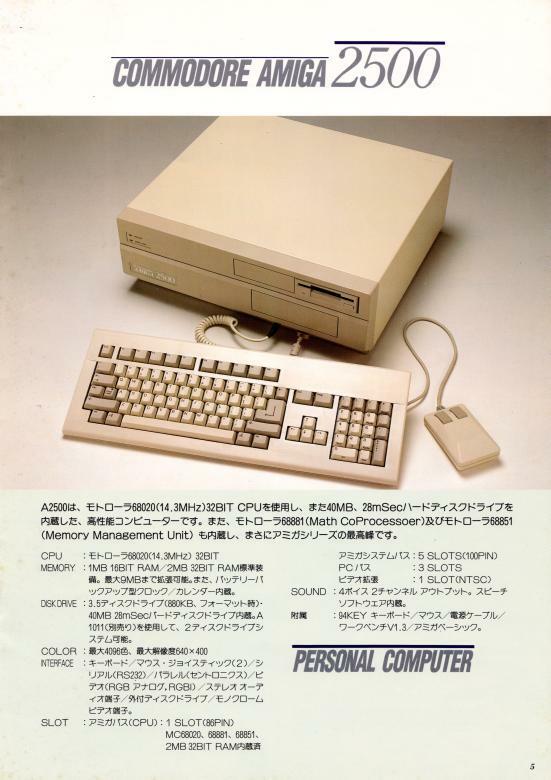 In 1989, the A2500/20 was replaced by the Amiga 2500/30, which came with the A2630 CPU card, 25 MHz 68030 and the 68882 FPU with up to 4 MB of 32-bit memory. The accelerator cards, A2620 and A2630, were also available separately as upgrades for the Amiga 2000 or Amiga 2500/HD. Because the Amiga 2500 has a Motorola 68000 on the motherboard that goes unused, the design is not very cost-effective. 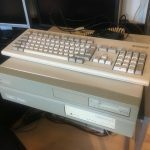 A project to replace it with a 68020 on-board began, intending to be a Zorro-II-based (16-bit expansion slots) 68020 machine, but the project eventually became the Amiga 3000 when Dave Haynie sought to include his new Zorro-III bus (32-bit expansion slots). The A2500 remained in production after the release of the Amiga 3000, maybe because the original NewTek’s Video Toaster (video broadcast and editing hardware) will not fit in an unmodified Amiga 3000 case. According to ex. 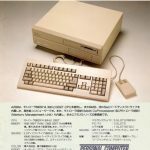 Commodore employees, they still sold big numbers of Amiga 2500 after the release of the Amiga 3000, customers seemed to like the bigger housing of the A2500. Until the release of the Video Toaster 4000, the Amiga 2500 was the fastest computer available for use with the Video Toaster. 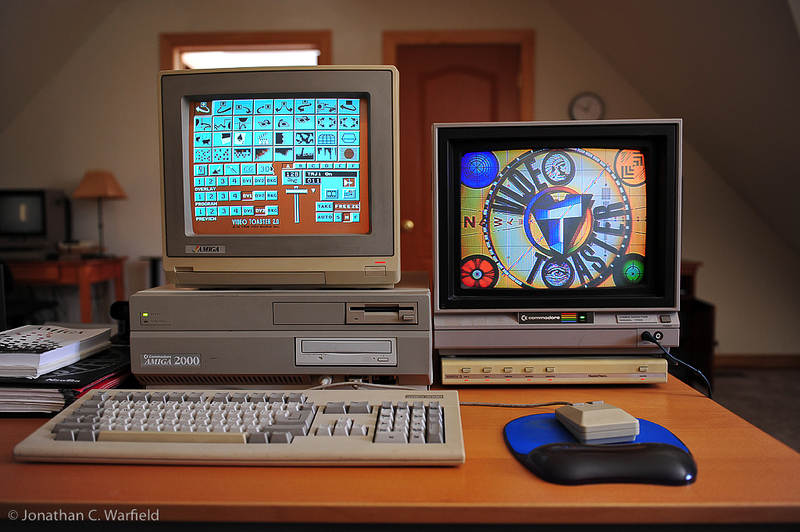 A variant of the Amiga 2500 called the Amiga 2500UX was also available, which was supplied with Commodore Amiga UNIX (Amix) and tape drive. After unpacking, I hooked it up and turned it on immediately, no patient to check it inside. The power supply “protection circuit” would switch it off at once. Opened it and found that the hard drive controller card had loosened a bit after transportation. Now, the power stayed on, but the power lamp was just blinking and no boot. Then I decided to remove the drive cluster and power supply in order to re-seated all the chips in their sockets. SUCCESS, the machine booted from the hard drive into Workbench 3.1. The Amiga 2500 missed the 68030 CPU card that it had originally. At least it had an hard drive, additional Fast RAM (CPU RAM) and CD-ROM though. An GVP SCSI controller with 8 MB additional RAM along with an 18 GB SCSI Ultra disk that got an SCSI Ultra – SCSI adapter. It also had the latest Kickstart ROM 3.1 and 1 MB onboard Chip RAM (1 MB Chip RAM is standard in later revisions). Traded some games and hardware for an GVP 030@25 MHz CPU/accelerator card. This card also got an SCSI controller with DMA to its on-board 32 bit Fast RAM. So removed the other hard drive controller and connected this one to hard drive and CD-ROM. Soldered in a new RTC battery (clock battery). The original battery was already removed from previous owner to avoid leaking and damage to the main board. Got hold of 3 x 4 MB 32 bit “GVP SIMM” RAM for the CPU card, the card already got 1 MB soldered on so this gives 13 MB Fast RAM in total. Upgraded with ECS Denise chip (graphic chip). Now the “new” graphic modes in “31 kHz VGA” are available, but restricted to 4 colors of a palette of 64 colors only, due to bandwidth capacity. Still works great when running the original 4 color icon set in Amiga OS 3.1. Installed the A2286AT PC emulator card together with an VGA ISA card and a Sound Blaster 2.0 ISA card. 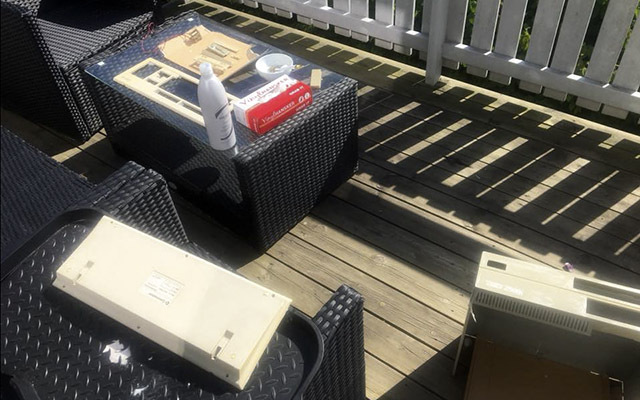 Cleaned and retro-brightened the plastic parts in the sun with hair bleaching cream (H2O2, hydrogen peroxide), to remove yellowing, worked out great. 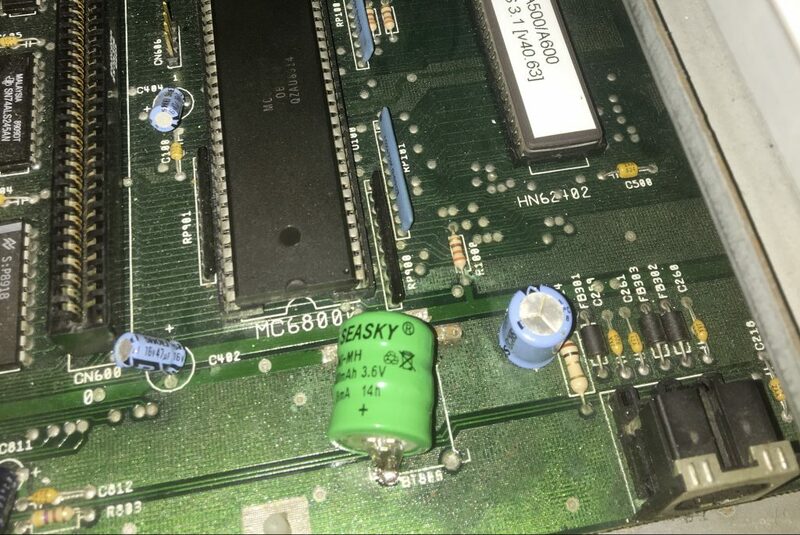 Installed a an 50 MHz 68882 FPU (math co-processor) on the CPU card, with a separate oscillator to make it run at 50 MHz while the CPU still runs at 25 MHz. My A2500 after “retro-brightening”. Yellowing removed. 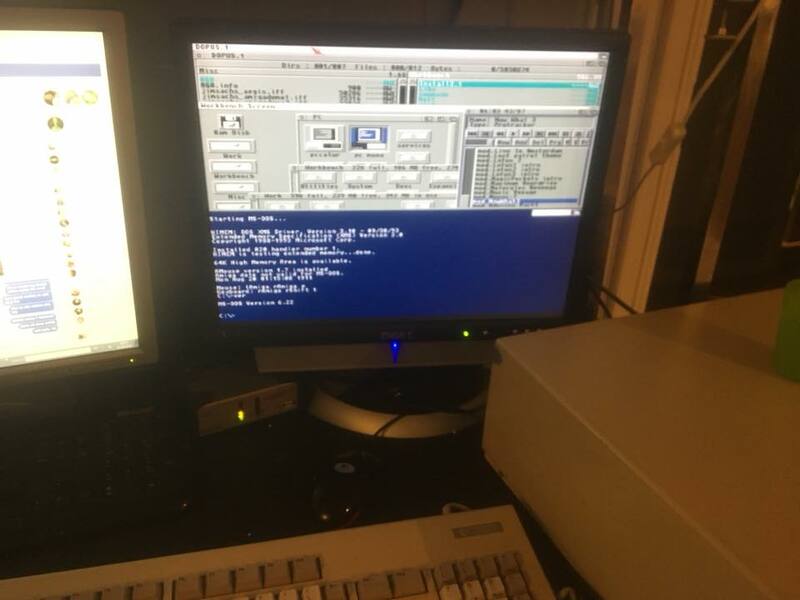 My A2500 running Amiga OS and MS-DOS simultaneous.